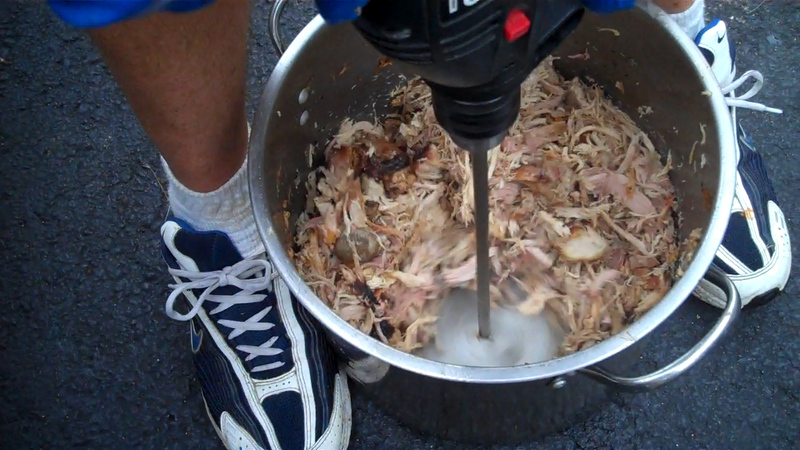 Watch this South Carolina Cooker make quick work pulling a 15 pound whole shoulder in 30 seconds. Impressive tool. Combine 2 cups of salted mixed nuts into 1 teaspoon Chipotle chili powder, 1/4 teaspoon each ground cumin and pepper, and 1 tablespoon butter on a sheet of foil. Form a small package then put over grill over medium heat. Turn often for around 10 minutes. Toss 1/2 cup shredded cheese, 2 tablespoons softened butter, 1 grated garlic clove and salt. Divide 1 loaf French bread lengthwise and place cut-side up on a sheet of foil. Spread with the cheese mixture then form a packet. Grill for 10 minutes over medium-high heat. Sprinkle shredded cheese on one half of a flour tortilla. Top with chopped chicken and cilantro then fold in half to seal. Make more with the same procedure. Seal in individual foil packages. Grill over medium heat, turning once, for about 5 minutes. In a pan, combine 1 cup uncooked rice, 1 1/4 cups chicken broth, 6 peeled large shrimp, 2 skinless chicken thighs, 2 sliced dried chorizo, 1/4 cup each pimiento-stuffed olives and roasted pepper strips, and 1/2 teaspoon smoked paprika. Sprinkle with olive oil and pepper then seal pan in foil. Grill in medium high heat for about 30 minutes. In a mixing bowl, combine 1 pound ground beef with 1 egg, 1/4 cup each breadcrumbs and grated cheese, minced garlic clove and 1/4 teaspoon each salt and pepper. 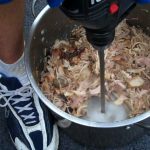 Mix thoroughly then make 1 1/2-inch balls. Arrange in a one layer on a sheet of foil then top with 1/2 cup tomato sauce. Form a packet. Grill over high heat for 25 minutes. In a disposable pie pan, mix 1 tablespoon vegetable oil and 1/4 cup popcorn kernels. Seal pan in 2 sheets of foil enough to make a dome shape on top. 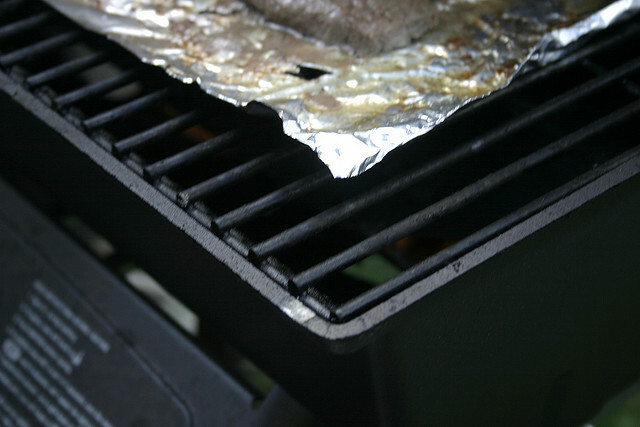 Grill over high heat, shaking, until popping stops. This should be about 8 minutes. Sprinkle with salt. On a sheet of foil, combine 1/2 cup sliced dried chorizo, 2 sliced green or red bell peppers, 1 sliced onion, 2 tablespoons olive oil, salt and pepper. Form a packet. Grill over high heat, turning a few times for 10 minutes. Butter 4 ears corn and sprinkle with cheese, cayenne and lime juice. Seal in individual foil packets. Grill over medium-high heat, turning a few times for 15 minutes. Toss 2 cups kosher salt and 2 sprigs chopped rosemary on a sheet of foil. Cover 1 1/2 pounds baby potatoes with the salt mixture and form a packet. Grill over medium heat, covered, for 45 minutes. In a bowl, fluff up 2 eggs, 1 cup milk, 1/2 cup sugar and 1/4 teaspoon cinnamon. Add 4 cups bread cubes and 1 cup berries then soak for 30 minutes. Butter a sheet of non-stick foil and add the bread mixture. Form a packet. Grill over indirect heat, turning once in a while for 35 minutes. Find a wide array of Cast Iron Frying Pans and Grills at Your Smart Kitchen. Your online source for quality cookware, bakeware, cutlery, small appliances and related kitchenware at reasonable prices. See something else you may be interested in and contact us. To avail of monthly specials and coupons, become a Chef Wannabee. This week in the http://GrateTV.com podcast we cover burnt ends. A tasy discovery that helps brisket competition cookers really win beef categories. Plus it’s an incredible snack or sandwich. Take a look at the tips and tricks we got from our friends in Myrtle Beach, SC.